We’ve been running a week-long summer holiday club at St Catherine’s for over 25 years now. It’s for children aged 4 – 11 and lasts 2 hours each morning. The 2018 Holiday Club is entitled ‘Rocky’s Plaice’. Rocky not only runs a fish and chip shop, but he also runs a church which meets in his shop. He’s not the most organised of people, so chaos ensues. be the normal mixture of Fun, Games, Craft, Bible Stories and Songs, plus the chance to perform Drama and Song. Rocky’s Plaice is from Monday 13th August to Friday 17th, from 10am to 12noon. 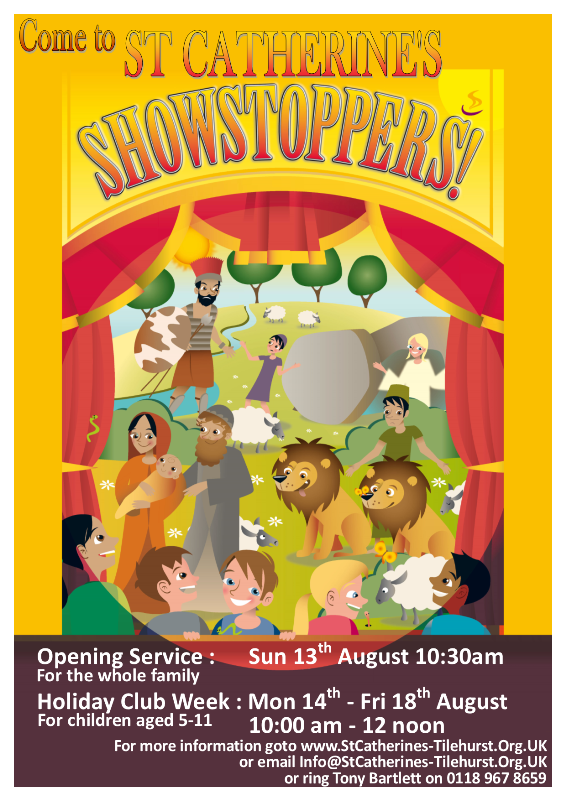 These is also an opening ‘preview’ service for all the family on Sunday 12th August at 10:30am. The cost is £10 for the week, this is to cover refreshments and materials (a reduction to £5 for additional children in the same family). On Friday 17th August, shortly after 12.00 noon, there will be a ‘Closing Celebration’ – a chance for the whole family to enjoy highlights of the week and then stay on for lunch. For all the latest news about out Holiday Club, click here. If you haven’t already got registration forms, either pick one up from church, or contact us at info@stcatherines-tilehurst.org.uk . Last year our annual Holiday Club was called “SHOWSTOPPERS”. We were joined by nearly 70 children to lift the curtain on the greatest show on earth – God’s great plan for salvation! Every morning, through fun, games, video, stories, songs, drama and craft; we looked at a well known story from the Bible that helps us understand God’s plans for us and his creation. At the end of each morning, different groups of children had the chance to be SHOWSTOPPERS as they perform a drama or song for parents. Click here to see more details of previous holiday clubs.